Hurricane Nicole made landfall in Bermuda around 11 a.m. EDT on Oct. 13, and NASA's Terra satellite captured an image of the storm within the hour. On Oct. 13, before landfall in Bermuda, Hurricane Nicole strengthened to a Category 4 storm on the Saffir-Simpson Hurricane Wind Scale with maximum sustained winds of 120 mph. At 11:20 a.m. EDT (15:20 UTC) NASA's Terra satellite captured a visible image of very large Hurricane Nicole about 10 miles east of the island. 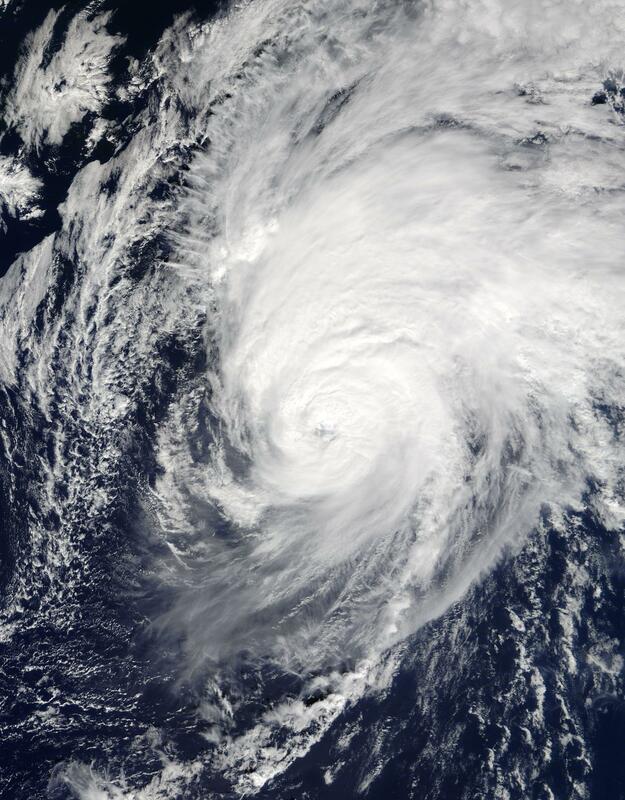 On Oct. 14 Nicole was racing east-northeastward over the Atlantic, but large ocean swells from the large storm were spreading northward along the U.S. East Coast and into Atlantic Canada. At 5 a.m. EDT (9:00 UTC), the National Hurricane Center (NHC) said, "The cloud pattern has degraded significantly during the past few hours. The low-level center is difficult to locate, but it appears to be separated and well to the southwest of an area of weakening convection due to southwesterly shear." The center of Hurricane Nicole was located near 35.4 degrees north latitude and 59.2 degrees west longitude, about 675 miles (1,090 km) south-southeast of Halifax, Nova Scotia, Canada. NHC said Nicole is moving toward the east-northeast near 21 mph (33 kph). This general motion is expected to continue today with a decrease in forward speed expected on Saturday, Oct. 15. Maximum sustained winds are near 85 mph (140 kph) with higher gusts. Weakening is forecast during the next 12 to 24 hours, but Nicole is expected to remain a powerful cyclone even when it could become a post-tropical cyclone on Saturday. Hurricane-force winds extend outward up to 70 miles (110 km) from the center and tropical-storm-force winds extend outward up to 205 miles (335 km). For updated forecasts on Nicole, visit the NHC website: http://www.nhc.noaa.gov.